John McCain Funeral: Joe Biden Honors Friend: 'We Shall Not See His Like Again' Speaking at McCain's memorial, the former vice president choked up more than once. "I always thought of John as a brother," Biden said. "We had a hell of a lot of family fights." Joe Biden, speaking at a memorial service for John McCain, noted that he had given a lot of eulogies over the years. But "this one's hard," he said. He choked up, wiped away a tear at the ceremony at North Phoenix Baptist Church in Arizona, and continued. "I always thought of John as a brother," Biden said. "We had a hell of a lot of family fights." McCain requested that the former Democratic vice president eulogize him at his funeral. And through the lens of today's era of partisanship, their friendship makes little sense. Biden is cut from a decidedly liberal cloth; McCain was conservative. And they deeply disagreed on policy. But they were friends for 40 years, born out of a mutual respect for each other and love of country. Both men were forged in the fires of deep pain — Biden lost his wife and daughter in a car accident; McCain had just gotten out of Vietnam, where he was tortured at the hands of his captors for 5 1/2 years. Biden said at the ceremony Thursday that when they became friends, they didn't talk about those two things that had shaped each other's lives. But they both clearly meant something deeply important to each other. "I trusted John with my life," Biden said. And, he added, "The thing that's understated the most was his optimism. That's what made John special, made him a giant among us." Biden, as he has done repeatedly over the years at funerals, played a pastoral role. "The disease that took John's life — that took our friend Ted Kennedy's life. 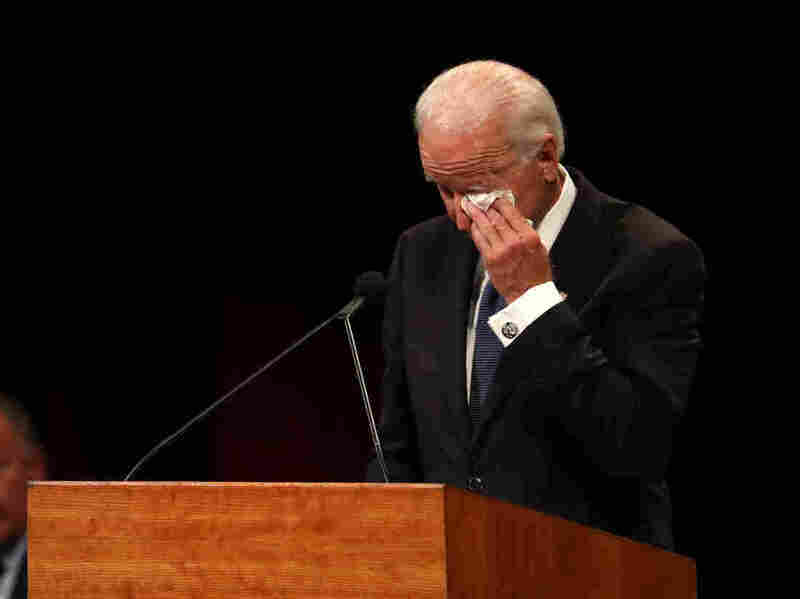 That took my son Beau's life — is brutal, relentless, unforgiving," Biden said. "It takes so much from those we love — and from the families who love them — that in order to survive we have to remember how they lived — not how they died." The image he carries with him of Beau, he said, is one of him starting a boat, smiling and waving. "Not the last days," he said. To McCain's family, Biden said, "You will all find your own images." Maybe it's a smile, a laugh, a rub on the shoulder, a touch on the cheek. Or, he added, "The sheer joy that crossed his face when he was about to take the stage on the floor of the Senate and start a fight. God, he loved it." Biden, a man who has seen and felt great pain, promised those closest to McCain that there will come a day when the mention of McCain's name will bring a smile to their faces before a tear to their cheeks, and that's when they will know they will make it. Biden ended his speech, paraphrasing Shakespeare before banging the lectern: "We shall not see his like again." Rick Davis, who was McCain's campaign manager, said earlier this week of their friendship, per NBC News: "If there's a better of exemplification of debating and throwing a few punches, but at the end of the day being able to maintain a relationship with the people you are at battle with, as the model of governance John McCain adhered to, that relationship with Biden was in the category." McCain's friendship with Biden was one in a long line of Democrats he reached out to and befriended over the years. It was, in part, because McCain believed in the necessity of reaching across the aisle to get big things done. But it was also because he just liked some of them, and he wasn't going to let politics get in the way. Biden lamented the decline of bipartisanship in the Senate. He pinned the decline back to a moment in 1996. Up until then, he said, he and McCain would often sit next to each other during floor fights while issues were debated, either Biden going over to the Republican side or McCain venturing over to him. One day, though, Biden said, McCain and Biden were each approached separately by leaders of their respective caucuses, who told them to stop sitting with each other because "it didn't look good." Biden said that kind of attitude makes it "impossible to reach consensus." He added that today, people in both parties are busy attacking each other's motives rather than the substance of their arguments. McCain was also good friends with the late Sen. Ted Kennedy, the Massachusetts liberal, who died of the same brain cancer nine years earlier and with whom he had worked on comprehensive immigration reform. "Some of the biggest fights I'd ever had was one with Ted Kennedy," McCain joked on CBS's 60 Minutes last year. And yet, he added, "We were the closest of friends. ... Whether you liked him, whether you disliked him, whether you agreed with him or disagreed with him, he was always ready to do battle, but he wasn't ready to get personal. And that's what matters." McCain also invited another Democrat to eulogize him at his funeral: Barack Obama, the man who defeated him for the presidency in 2008. Obama is set to speak Saturday at the National Cathedral. Former Connecticut Sen. Joe Lieberman, an independent/Democrat, will also speak that day. McCain wrote in his book The Restless Wave that he wished he had picked Lieberman to be his vice presidential running mate in 2008. Obama will follow former President George W. Bush, with whom McCain also sparred. Bush defeated McCain for the Republican nomination for president in 2000 in a bitter battle. Not invited to speak: Sarah Palin, McCain's vice presidential pick in 2008, or President Trump. Trump and McCain both had charmed upbringings, but they couldn't have made more different choices with their lives. McCain wasn't one for conspiracy theories; he was generally courteous and respectful of the press — and, mostly, he truly believed in the system of governance the Founders set up. McCain's funeral, which he had a great say in planning, was full of diversity — along with Biden were a former Republican chief of staff, a Latino pastor, a Mexican-American Democrat who chaired his early Senate campaign, a Navajo flutist, and Larry Fitzgerald, a wide receiver for the Arizona Cardinals, who is black. Grant Woods, McCain's former chief of staff, delivered what sounded like a veiled shot at Trump, noting that McCain "wouldn't stand by" when people tried to stamp on the Bill of Rights, "including the First Amendment." Biden, quoting the Declaration of Independence, said, "We hold these truths to be self-evident, that all men are created equal, that they are endowed by their Creator with certain unalienable rights ..."
Then he thundered, "To John, those words had meaning." He added, "You could come to a different conclusion, but where he'd part company with you — if you lacked the basic values of decency, respect, knowing that this project is bigger than yourself." Trump and McCain never patched things up. And McCain, whose casket exited the church to Frank Sinatra's My Way, got the last word.